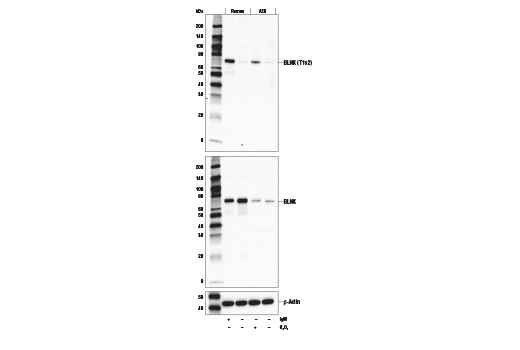 Western blot analysis of extracts from Ramos and A20 cells, untreated (-), or treated (+) with either anti-human IgM (12 μg/ml, 10 min), or H2O2 (11 mM, 1 min), using Phospho-BLNK (Thr152) Antibody (upper), BLNK (D3P2H) XP® Rabbit mAb #36438 (middle), or β-Actin (D6A8) Rabbit mAb #8457 (lower). 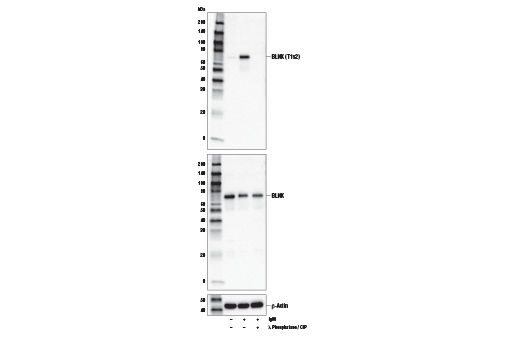 Western blot analysis of extracts from Ramos cells, untreated (-) or treated with anti-human IgM (12 μg/ml, 10 min; +), and lambda-phosphatase and calf intestinal phosphatase (λ-phosphatase/CIP; +) as indicated, using Phospho-BLNK (Thr152) Antibody (upper), BLNK (D3P2H) XP® Rabbit mAb #36438 (middle), or β-Actin (D6A8) Rabbit mAb #8457 (lower). Phospho-BLNK (Thr152) Antibody recognizes endogenous levels of BLNK protein only when phosphorylated at Thr152. Polyclonal antibodies are produced by immunizing animals with a synthetic phosphopeptide corresponding to residues surrounding Thr152 of human BLNK protein. Antibodies are purified by protein A and peptide affinity chromatography. B cell linker protein (BLNK), also known as SLP-65 or BASH, is an adaptor molecule that plays key roles in B cell activation and B cell antigen receptor (BCR) engagement. BLNK acts at the interface between BCR-associated Syk and downstream signaling cascades (1,2). BLNK has multiple SH2 binding motifs (YXXP) at its amino terminus and an SH2 domain at its carboxy terminus. After BCR ligation, BLNK is phosphorylated by Syk at multiple YXXP motifs including Tyr72, Tyr84, Tyr96, and Tyr178 (1). These phosphorylated motifs provide docking sites for signaling molecules, such as BTK, PLCγ, and Vav. These signaling molecules bind to BLNK through their SH2 domains and together activate downstream signaling pathways (3,4). Through its SH2 domain, BLNK can also interact with tyrosine-phosphorylated targets, such as HPK1, thereby recruiting them to the BCR complex for signaling (5). Following BCR ligation, BLNK is phosphorylated at Thr152 by the hematopoietic progenitor kinase 1 (HPK1) (6). This phosphorylation induces interaction with 14-3-3ε, which leads to the disassembly of BCR signaling complexes and downregulation of BCR signaling (6). Kurosaki, T. and Tsukada, S. (2000) Immunity 12, 1-5. Fu, C. et al. (1998) Immunity 9, 93-103. Ishiai, M. et al. (1999) Immunity 10, 117-25. Baba, Y. et al. (2001) Proc. Natl. Acad. Sci. USA 98, 2582-86. Tsuji, S. et al. (2001) J. Exp. Med. 194, 529-39. Wang, X. et al. (2012) J Biol Chem 287, 11037-48.